A Heaven: Biblical Answers To Common Questions booklet. This 60-page booklet is a perfect supplement to provide for those attending funerals or memorial services and includes the gospel message. 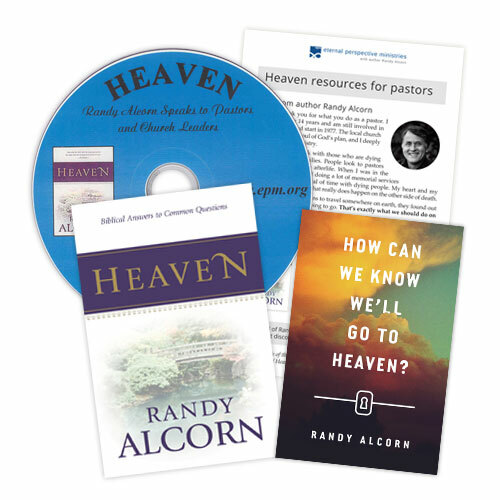 An informational brochure listing the many other resources Randy has made available for those teaching on the subject of Heaven. Promotional video by Randy, speaking to those who will be studying about Heaven. View a sample Heaven Sermon Outline. We have two reader-created resources to share for use with students studying Randy's Heaven for Kids book. These are unofficial study guides (created by readers and shared with EPM) available in PDF form only. An application that provides an entertaining quiz to see how well your Biblical knowledge is about what Christians can expect in Heaven. Many people are not aware that the Bible gives us many hints as to what awaits Christians after death. Test your knowledge with questions selected from content by Dr. Randy Alcorn, author of the bestselling book Heaven. App includes additional content on the topic of Heaven, according to the Bible. This can be a fun evangelism tool. At this time the app is not available for the Droid platform. Jesus is preparing a place for us. He’s the ultimate Carpenter. I am leading a group studying Heaven, and I really want to get people excited about studying it. Do you have any suggestions of questions I could ask the group to encourage conversation and get people thinking about Heaven?